Voracious sea stars and warming sea temperatures conspired to decimate the North Coast's red abalone population. The state's Fish & Game Commission banned recreational harvesting of the mollusks in 2018, in hopes of giving the critters a chance to recover. Late last year, Fish & Game extended the closure to 2021, because the population has not rebounded. I know it's hard on divers who love the sport and the dive shops that depended on the diving trade, but the gastropods need all the breaks they can get. The ban opens up other diving opportunities. In fact, diving for abalone is too easy. They don't move so quick and it's easy to get your limit. Want a challenge? 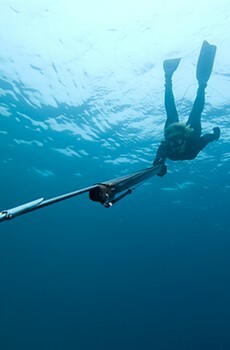 Try spearfishing. Spearfishing hunting grounds occur where abalone live, in rocky crevices and reefs. But your prey—cabazon, ling cod and various rockfish—are wily and hide in holes or stay still in hopes you won't notice them. It's definitely worth taking a class or two to learn technique and safety, but you don't need to be a master breath-holder to take up the sport. The good folks at Santa Rosa's Seals Watersport have all the gear and expertise you need. 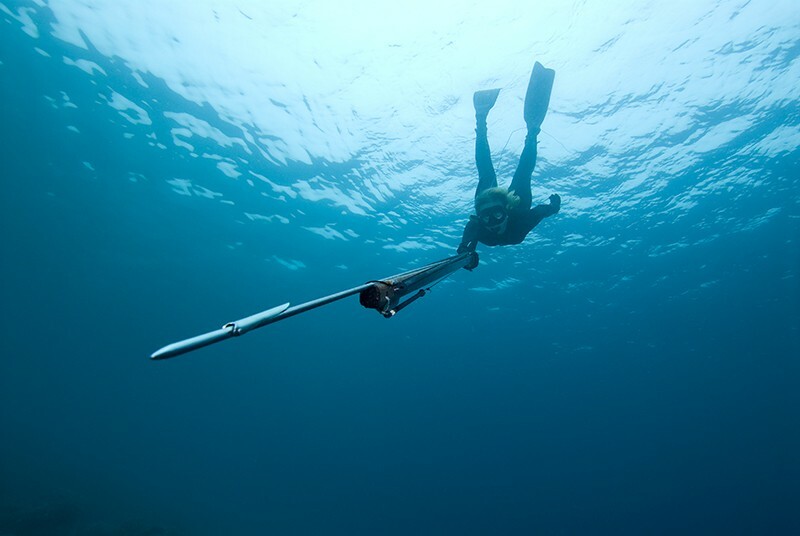 It helps to be physically fit to dive, but the secret to spearfishing is to remain calm. Remaining calm slows your body's consumption of oxygen, meaning you can stay under longer while you chill and enjoy the hunting expedition. And here's another benefit of spearfishing over ab diving: fish are much easier to clean than abalone. And let's be honest, emerging from the water with a speargun and a fat fish is pretty badass. 2112 Armory Drive, Santa Rosa. 707.542.3100. sealswatersports.com. —S.H. Oreo cows. They're a thing. Not just something your goofy friend shouts in the car, pointing to a Napa hillside—quoting the Napa Valley Register, in a news headline from 2008: "Oreo Cows wander on to Highway 29." That particular herd of Belted Galloways, which are visually bewitching on account of being generally black on both ends with a creamy white center, has long been beloved by cow spotters on their way to Napa Valley winetasting. But cow-mad hikers may be pleasantly surprised to find, upon rounding a bend on a trail in the new Jenner Headlands Preserve, they're face to face with their favorite striped cow. And that's not the first pleasant surprise at Jenner Headlands, which opened to the public in September 2018. 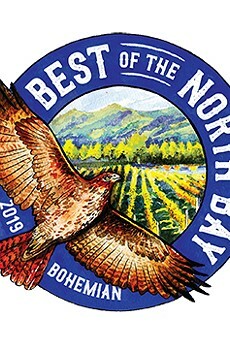 The gates and facilities are handsomely constructed, there's a telescope for whale watching from the bluff, and parking is free, thanks to a partnership between the Wildlands Conservancy and Sonoma Land Trust. They brought in a new rancher to manage the cows in 2014, says Wildlands regional director Brook Edwards. The breed was developed in Scotland to thrive in coastal environments, and is a bit smaller than more typical breeds in this region. The cows are rotated to different pastures when grazing targets are met. "That creates a mosaic of grassland habitat on the coast. There are birds and mammals and reptiles that need these grasslands to persist," says Edwards. And of course, they're a hit. "People tend to really like them out here." 12001 Hwy. 1, Jenner.—J.K. They're cool, they're creative, they're fast—and they're zucchinis. And they are out to squash the competition. 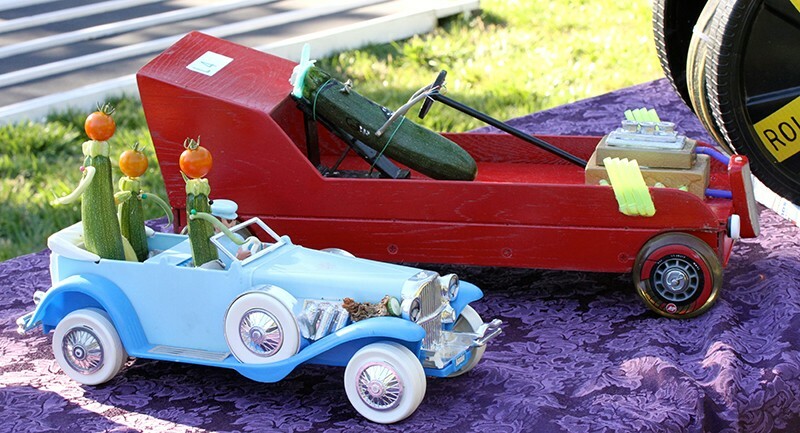 For over 30 years, the Sonoma farmers market has been host to the annual Zucchini Races, now held at Sebastiani Winery's Arbor Park in August. In the wacky squash-season event, zucchinis are rigged with wheels, or placed in squash-themed conveyances of some sort, where they compete against each other in heats of four at a time. That's how big the track is—just four lanes. The races have been widely covered by press around the world, and have been praised for their garden-friendly creativity by such foodie favorites as Lisa Atwood, a Sonoma-based cookbook author who's written about the races on her popular Sonoma Family Cook blogsite (and who took this picture!). Originally devised by Sonoma's Hilda Swartz, the event has proven so popular, other markets around the county (Windsor and Healdsburg among them) have recently introduced zucchini races to their own summer activities. sonomaplazamarket.org.—D.T. My friend Brett Foxwell is an incredibly talented machinist, animator and filmmaker whose number one quality might just be his unwavering patience. His epic stop-motion animated short film, Fabricated, took 10 years of design and filming, where Foxwell created a trippy, surreal world of Frankenstein-like machines. Another of his projects, WoodSwimmer, involved him taking discarded pieces of wood and shaving layers off one at a time to reveal the hidden patterns underneath. That project caught the eye of director Darren Aronofsky, who included it in last year's National Geographic series One Strange Rock. Beyond his intricate model building and filmmaking, last year Foxwell shared with me his other obsession: digging for potatoes. It was at the Great Peter Pumpkin Patch, the annual October offering from Spring Hill Jersey Cheese and Petaluma Creamery that features hay rides, a corn pit, farm animals and a field of potatoes that visitors can visit and dig through to collect their spuds. I met Brett and his partner, Isabel, at the patch expecting to try some pumpkin ice cream and grab a future Jack-o'-lantern while hanging out on the farm, but Brett had other ideas. Like a shot, he took off to the potato field, a bag at the ready to collect his haul. But this was late in the day and late in the season, and wouldn't you know it, there was not a potato to be found among the mounds of dirt. That didn't stop Brett. With a concentration usually reserved for open-heart surgery, Foxwell grabbed his shovel and began to methodically, obsessively dig through the trenches, determined to farm those taters like his life depended on it. It felt like forever, but eventually Brett found two tiny little tots lounging in the field that he triumphantly raised into the air like rescued puppies. I didn't have the heart to tell him that I spied boxes of potatoes off to the side, surely meant to refill the field for tomorrow's crowds. It didn't matter. Brett got his potatoes and the satisfaction of pulling them from the earth's embrace himself. springhillcheese.com.—C.S. East of Santa Rosa (which is like east of Eden except not exactly Eden), there is something quite rare. It's a bridge. It's just a little footbridge. And while it may seem like we've got plenty of bridges, maybe we don't always have enough in the right places. The story goes like this: some 100 years ago and then some, the Southern Pacific Railroad tooted its way down the right-of-way that's now called Channel Drive past Trione-Annadel State Park. Destination: Sonoma and points beyond. Later on, the tracks were abandoned. What an opportunity! But this was still a long time ago, before Rails-to-Trails, when the thing that people did with invaluable, alternative routes through the landscape was to slice and dice them until they didn't connect nobody to nothing. A bridge of regret? There's more. Then we got the park, which is a public good, and it got new neighbors in the White Oak subdivision, which is gated. Bicycle enthusiasts used a pathway connecting the public park to public streets, to bypass a particularly hair-raising stretch of Highway 12. Acrimony ensued, and public use lost the suit. But before the end of the road, there's this little bridge, easy to miss. A bridge of hope? Well, it certainly encourages courtesy from all users, as it's so narrow that no two can pass. Poor little bridge. But it's all they've got. Walkers from the Oakmont side must be sure-footed to climb the steep, dirt bank to the road. Cyclists on road wheels must exercise caution on the turn. Everyone can stop in the middle when they've got it all to themselves for a minute, and take in the calming sight of that water burbling gently under the bridge.—J.K.